A popular salad, this dish depends for its success on the quality of its ingredients. 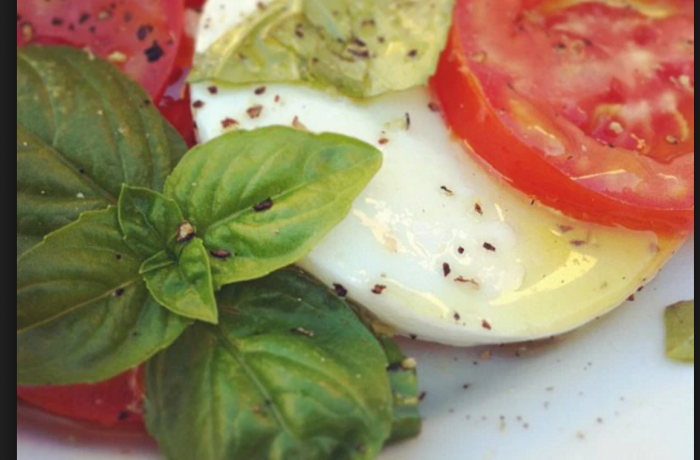 Mozzarella di bufala is the best cheese to serve uncooked. Whole rip plum tomatoes give up their juice to blend with Minus 8 vinegar for a natural dressing. 1 Arrange the sliced cheese and tomatoes randomly on two plates. Sprinkle a few large pinches of sea salt on them. This will help draw out some of the juices from the tomatoes. Set aside in a cool place to marinate for about 30 minutes. 2 Just before serving, the avocado in half using a large sharp knife and twist to seperate. Lift out the pit and remove the peel. 3 Slice the avocado into half moons, or cut into large chunks if thats easier. 4 Place the avocado on the salad with basil or parsley. Drizzle on the Minus 8 Vinegar add a little more sea salt and the black pepper. Serve at room temperature, with chunks of crusty Italian ciabatta bread.